Jackson Buck started in radio at KOPN-FM in Columbia, Mo. in 1995 where he hosted a daily (M-F) 4-hour free-form show entitled “89 In the Afternoon”. After station management switched weekday programming to NPR talk, Jackson hosted 2 weekend shows: “Alt-Americana” on Sunday, and “Saturdays With Jackson Buck”. Known as “the elder statesman of Twin Cities roots radio”, Jackson has been hosting programs on KFAI since 1997 and has had shows in seven different timesltots since then. His first program, “Fresh Air In The Morning”, aired Thursday mornings during drive-time (6:00-9:00) from 1997-1999. In 2000, he moved to the Wednesday afternoon (3:00-6:00) drive-time strip and changed the name of the program to “Jackson’s Juke Joint”. He hosted that show and a live music series of the same name at the original Viking Bar until moving away from the Twin Cities in December, 2004. After Jackson moved to Boston, he passed the baton and microphone to Harold Tremblay who continued the Wednesday afternoon radio show. “Jackson’s Juke Joint”, the music series (now known as House Party Presents), continued Wednesday evenings at the original Viking until that club went out of business and the series was moved to the 331 Club in NE Minneapolis. Following a brief stint in 2005 at WMBR-FM in Cambridge, MA., Jackson returned to the Twin Cities and airwaves of KFAI in January, 2006. 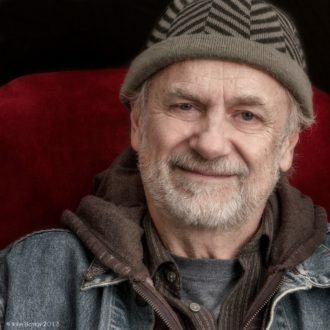 After the untimely death of “Urban Folk” founder and host Bob Feldman, Jackson became co-host (along with Beth Shaw) of that popular KFAI program from 2006 until June, 2007. With his current weekly show, which airs from 4:00-6:00 Thursday afternoons, Jackson is back to his Freewheelin’ ways on KFAI… taking requests, hosting interviews and live in-studio performances, and of course, playing a wide-variety of music that bounces from genre to genre. In addition to Freewheelin’, Jackson has teamed up with Nicholas “The Feelin'” David as co-host of the highly-ecclectic and popular program “East of Here, West of Now”, which airs Tuesday mornings from 10am-noon. Wanna’ be Jackson’s buddy on Facebook? Click here: https://www.facebook.com/freewheelinjackson Sorry, some other dude stole the Jackson Buck name on facebook. What, there’s more than one of him?